Dayton Mennonite Church, Dayton, Virginia, 2012. 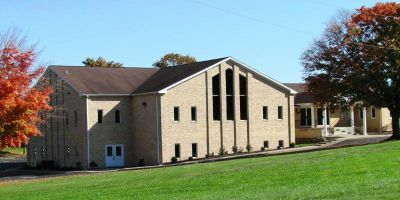 Dayton Mennonite Church in Dayton, Virginia, was established in 1972. It was a member of the Virginia Mennonite Conference before withdrawing from the conference in 2002 over doctrinal concerns. It then became a member of the Mountain Valley Mennonite Churches, a group of churches unwilling to join the then new Mennonite Church USA. In 2011 the pastor was Daryl S. Driver and the average attendance was 171. Anabaptist (Mennonite) Directory 2011. Harrisonburg, VA: The Sword and Trumpet, 2011: 65. Thiessen, Richard D. "Dayton Mennonite Church (Dayton, Virginia, USA)." Global Anabaptist Mennonite Encyclopedia Online. April 2012. Web. 22 Apr 2019. http://gameo.org/index.php?title=Dayton_Mennonite_Church_(Dayton,_Virginia,_USA)&oldid=139982. Thiessen, Richard D. (April 2012). Dayton Mennonite Church (Dayton, Virginia, USA). Global Anabaptist Mennonite Encyclopedia Online. Retrieved 22 April 2019, from http://gameo.org/index.php?title=Dayton_Mennonite_Church_(Dayton,_Virginia,_USA)&oldid=139982. This page was last modified on 8 November 2016, at 22:40.